As a continuation of the Lenten Spirituality Series, here is a passage from St. Alphonsus Liguori’s The Glories of Mary. 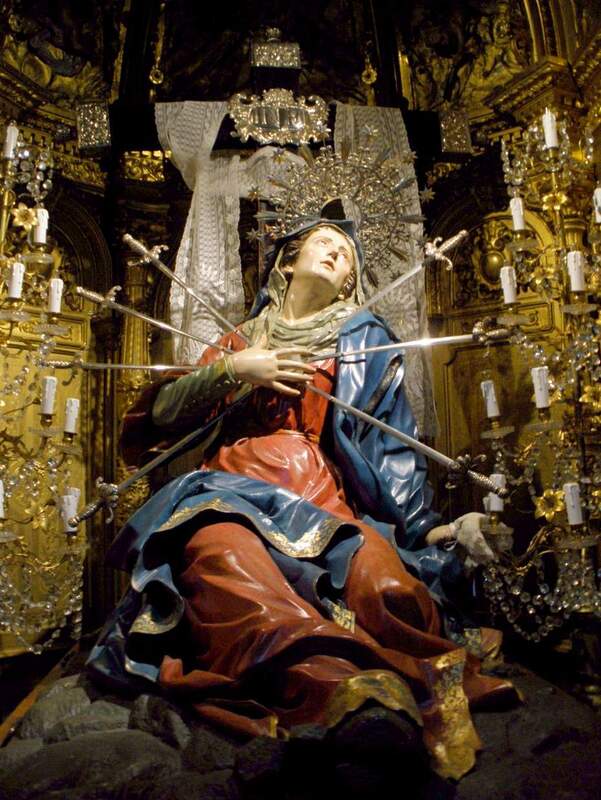 The Friday in Passiontide is the Church’s traditional commemoration of Our Lady’s seven sorrows; it is a fitting prelude to the divine suffering of her Son in Holy Week. I am particularly fond of St. Alphonsus, as he was one of the greatest mystics of the eighteenth century. 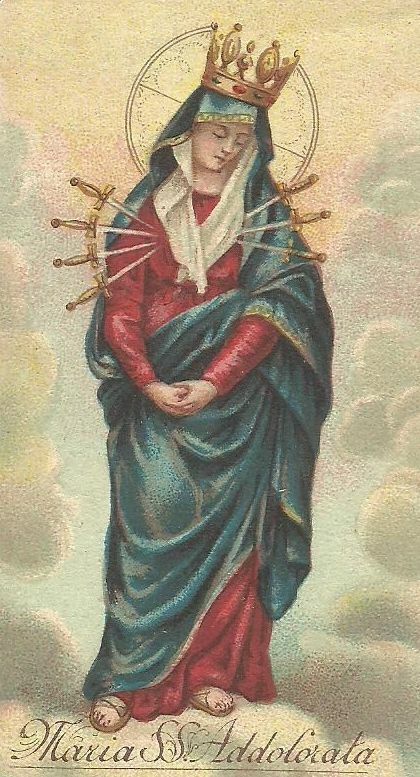 As Jesus is called the King of sorrows and the King of martyrs, because He suffered during, His life more than all other martyrs; so also is Mary with reason called the Queen of martyrs, having merited this title by suffering the most cruel martyrdom possible after that of her Son. Hence, with reason, was she called by Richard of Saint Lawrence, “the Martyr of martyrs”; and of her can the words of Isaias with all truth be said, “He will crown thee with a crown of tribulation;” that is to say, that that suffering itself, which exceeded the suffering of all the other martyrs united, was the crown by which she was shown to be the Queen of martyrs. That Mary was a true martyr cannot be doubted, as Denis the Carthusian, Pelbart, Catharinus, and others prove; for it is an undoubted opinion that suffering sufficient to cause death is martyrdom, even though death does not ensue from it. Saint John the Evangelist is revered as a martyr, though he did not die in the caldron of boiling oil, but he came out more vigorous than he went in. Saint Thomas says, “that to have the glory of martyrdom, it is sufficient to exercise obedience in its highest degree, that is to say, to be obedient unto death.” “Mary was a martyr,” says Saint Bernard, “not by the sword of the executioner, but by bitter sorrow of heart.” If her body was not wounded by the hand of the executioner, her blessed heart was transfixed by a sword of grief at the passion of her Son; grief which was sufficient to have caused her death, not once, but a thousand times. From this we shall see that Mary was not only a real martyr, but that her martyrdom surpassed all others; for it was longer than that of all others, and her whole life may be said to have been a prolonged death. Wherefore Mary might well say, in the words of David, “My life is wasted with grief, and my years in sighs.” “My sorrow is continually before me.” “My whole life was spent in sorrow and in tears; for my sorrow, which was compassion for my beloved Son, never departed from before my eyes, as I always foresaw the sufferings and death which He was one day to endure.” The Divine Mother herself revealed to Saint Bridget, that “even after the death and ascension of her Son, whether she ate, or worked, the remembrance of His passion was ever deeply impressed on her mind, and fresh in her tender heart”. Hence Tauler says, “that the most Blessed Virgin spent her whole life in continual sorrow;” for her heart was always occupied with sadness and with suffering. Therefore time, which usually mitigates the sorrows of the afflicted, did not relieve Mary; nay, even it increased her sorrow; for, as Jesus, on the one hand, advanced in age, and always appeared more and more beautiful and amiable; so also, on the other hand, the time of His death always drew nearer, and grief always increased in the heart of Mary, at the thought of having to lose Him on earth. So that, in the words addressed by the angel to Saint Bridget: “As the rose grows up amongst thorns, so the Mother of God advanced in years in the midst of sufferings; and as the thorns increase with the growth of the rose, so also did the thorns of her sorrows increase in Mary, the chosen rose of the Lord, as she advanced in age; and so much the more deeply did they pierce her heart.